8 November 1950: First Lieutenant Russell J. Brown, United States Air Force, 16th Fighter Interceptor Squadron, 51st Fighter Interceptor Wing, is credited with shooting down a Russian-built Mikoyan-Gurevich MiG 15 jet fighter near the Yalu River while flying a Lockheed F-80C-10-LO Shooting Star. This may have been the very first time that a jet fighter had been shot down by another jet fighter. Sources vary, reporting the serial number of Lieutenant Brown’s fighter as 49-713 or 49-717. “We had just completed a strafing run on Sinuiju antiaircraft positions and were climbing when we got word that enemy jets were in the area. “Then we saw them across the Yalu, doing acrobatics. Soviet records reported no MiG 15s lost on 8 November. 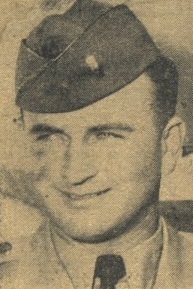 Senior Lieutenant Kharitonov, 72nd Guards Fighter Aviation Unit, reported being attacked by an F-80 under circumstances that suggest this was the engagement reported by Lieutenant Brown, however Kharitonov succeeded in evading the American fighter after diving away and jettisoning his external fuel tanks. A Soviet MiG 15 pilot, Lieutenant Khominich, also of the 72nd Guards, claimed shooting down an American F-80 on 1 November, but U.S. records indicate that this fighter had been destroyed by anti-aircraft fire. What is clear is that air combat had entered the jet age, and that the Soviet Union was not only supplying its swept wing MiG 15 to North Korea and China, but that Soviet Air Force pilots were actively engaged in the war in Korea. The Mikoyan-Gurevich MiG 15 is a single-seat, single engine turbojet-powered fighter interceptor, designed to attack heavy bombers. Designed for high sub-sonic speed, the leading edges of the wings and tail surfaces were swept to 35°. The wings were very thin to minimize aerodynamic drag. The fighter was 10.102 meters (33 feet, 1.7 inches) long, with a wingspan of 10.085 meters (33 feet, 1 inch). Its empty weight was 3,253 kilograms (7,170 pounds) and takeoff weight was 4,963 kilograms (10,938 pounds). The Rolls-Royce Nene I and Nene II jet engines had been used in the three MiG 15 prototypes. The British engines were reverse-engineered by Vladimir Yakovlevich Klimov and manufactured at Factory No. 45 in Moscow as the Klimov VK-1. The VK-1 used a single-stage axial-flow compressor, 9 combustion chambers and a single-stage axial-flow turbine. It produced a maximum 26.5 kilonewtons of thrust (5,957 pounds of thrust). The VK-1 was 2.600 meters (8 feet, 6.4 inches) long, 1.300 meters (4 feet, 3.2 inches) in diameter, and weighed 872 kilograms (1,922 pounds). The MiG 15 had a maximum speed of 1,031 kilometers per hour (557 knots) at 5,000 meters (16,400 feet) and 1,050 kilometers per hour (567 knots) at Sea Level. Armament consisted of one Nudelman N-37 37 mm cannon and two Nudelman-Rikhter NR-23 23 mm cannon. MIG 15 Red 2057. 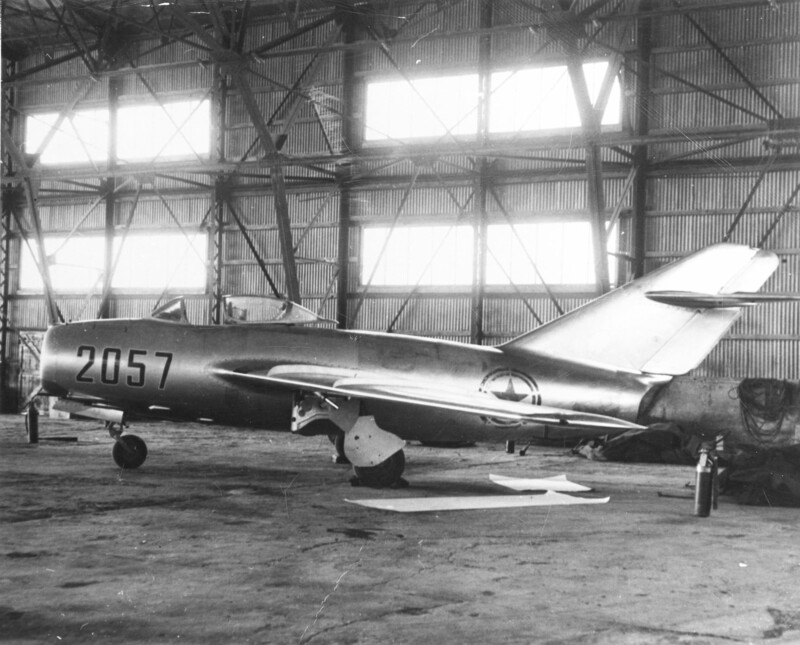 A North Korean Peoples’ Air Force Mikoyan-Gurevich MiG 15bis in a hangar at Kimpo Air Base, Republic of South Korea. 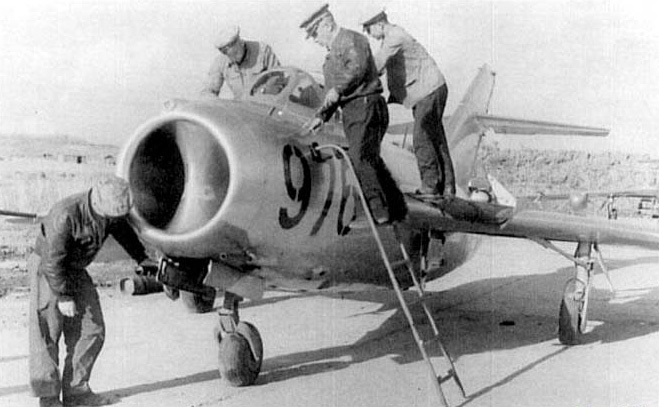 A defecting North Korean pilot, Lieutenant No Kum-Sok, flew it to Kimpo on 21 September 1953. It was taken to Okinawa, examined and test flown by U.S.A.F. test pilots, including Major Charles E. (“Chuck”) Yeager. This MiG 15 is in the collection of the National Museum of the United States Air Force, Wright-Patterson AFB, Ohio. (U.S. Air Force). The Lockheed P-80 Shooting Star was the United States’ first operational jet fighter. It was redesignated F-80 in 1948. It was a single-seat, single-engine airplane, designed by a team of engineers led by Clarence L. (“Kelly”) Johnson. The prototype XP-80A, 44-83020, nicknamed Lulu-Belle, was first flown by test pilot Tony LeVier at Muroc Army Air Field (now known as Edwards Air Force Base) 8 January 1944. The P-80A entered production in 1945. Improved versions, the P-80B and P-80C (F-80C) followed. Lockheed F-80C-10-LO Shooting Star 49-432 on display at the Air Force Armaments Museum, Eglin Air Force Base, Florida. The fighter is marked as F-80C-10-LO 49-713, assigned to the 16th Fighter Squadron, 51st Fighter Interceptor Group, Kimpo, Korea, 1950. 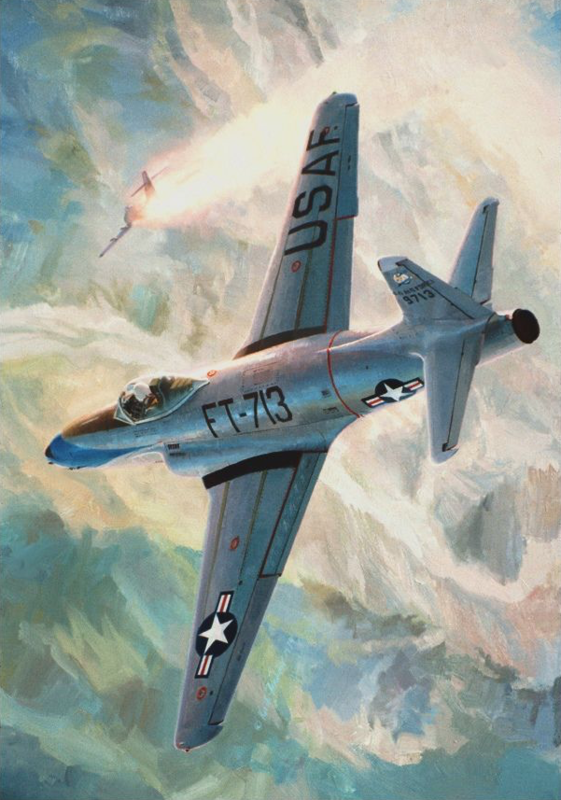 The F-80C was 34 feet, 5 inches (10.490 meters) long with a wingspan of 38 feet, 9 inches (11.811 meters) and an overall height of 11 feet, 3 inches (3.429 meters). It weighed 8,420 pounds empty (3,819 kilograms) and had a maximum takeoff weight of 16,856 pounds (7,645 kilograms). The F-80C was powered by either a General Electric J33-GE-11, Allison J33-A-23 or J33-A-35 turbojet engine. The J33 was a development of an earlier Frank Whittle-designed turbojet. It used a single-stage centrifugal-flow compressor, eleven combustion chambers and a single-stage axial-flow turbine section. The J33-A-35 had a Normal Power rating of 3,900 pounds of thrust (17.348 kilonewtons) at 11,000 r.p.m., at Sea Level, and 4,600 pounds (20.462 kilonewtons) at 11,500 r.p.m., for Takeoff. It was 107 inches (2.718 meters) long, 50.5 inches (1.283 meters) in diameter, and weighed 1,820 pounds (826 kilograms). The F-80C had a maximum speed of 594 miles per hour (956 kilometers per hour) at Sea Level and 543 miles per hour (874 kilometers per hour) at 25,000 feet (7,620 meters). The service ceiling was 46,800 feet (14,265 meters). The maximum range was 1,380 miles (2,221 kilometers). The F-80C Shooting Star was armed with six Browning AN-M3 .50-caliber aircraft machine guns mounted in the nose. Lockheed F-80C-10-LO Shooting Star 49-713, flown by Albert C. Ware, Jr., was lost 10 miles north of Tsuiki Air Base, Japan, 23 March 1951. Great article, Bryan! Growing up around Air Force bases (dad was a civilian Air Traffic Controller) I always saw lots of F-80’s (or T-33’s) playing.